When it comes to Corby Town this season, one would hope that ‘stability’ is a word that is being used around Steel Park. And before anyone starts frowning upon the idea of a bit of stability and that the word means a lack of ambition, allow me to explain. The past two seasons have been, for the want of a better word, dreadful. From the high of winning the Southern League title against all odds to the back-to-back relegations from the Vanarama National League North and, last season, from the Evo-Stik League Premier, it has been a bizarre few years for all associated with the Steelmen. All of a sudden, the club finds itself back at Step Four for the first time since 2006 and in a situation where it is almost having to start again. So, perhaps a bit of stability wouldn’t go amiss but one thing is for certain, another season of looking down rather than up really can’t be allowed to come into the equation. It’s a new era. 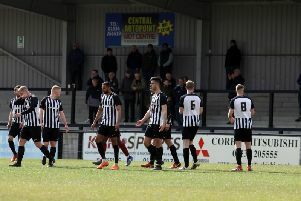 Corby have a young manager in David Bell at the helm and he has surrounded himself with experience in the form of Kevin Ward and Rob Gould in the new-look backroom staff. And, overall, I think Bell has done a decent job when it comes to his summer recruitment. It’s not secret that back-to-back relegations have taken their toll and the budget has been reduced to come in line with the level the club are at. But, with what he has available to him, Bell seems to have thrown together a squad that should, at the very least, be competitive in what I can assure you is a particularly tricky division. In Paul Bastock they have a very experienced and safe pair of hands and with the likes of Steven Leslie and Phil Trainer back on board, there is enough experience in there to help what will be a fairly young squad. Summer signing Sam Mulready has already shown in pre-season that he has an eye for goal, Ollie Brown-Hill will add a bit of flair to the squad and a lot will rest on the young shoulders of Corby boy Jordon Crawford, for whom this could well be a big season. There won’t be any bold predictions from me right now about what the Steelmen may be able to achieve this season. This is a tough division, I saw plenty of it last season and it’s a league that is littered with teams who are more than capable of beating each other on any given day. I, like the fans I am sure, just want to see Corby winning some games on a consistent basis again without having to look over their shoulder by the time the end of September comes around. I think the squad that Bell has put together has potential.